Arrive in Auckland – the “City of Sails” is New Zealand’s largest city and is bordered by two stunning harbours. Collect your rental car from the airport, explore the city, then make your way to your accommodation. Stay 2 nights in Auckland City. Leave the hustle and bustle of the city and discover the beautiful Hauraki Gulf Marine Park, which is visited by a staggering one third of all the types of marine mammals found on earth. 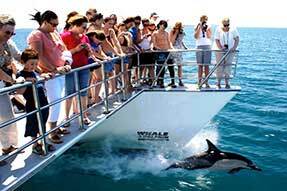 Departing directly from the Viaduct Harbour, you will be welcomed aboard the 20 metre, purpose-built vessel ‘Dolphin Explorer’ for an unforgettable marine mammal eco-safari out on the sparkling waters of the Hauraki Gulf. 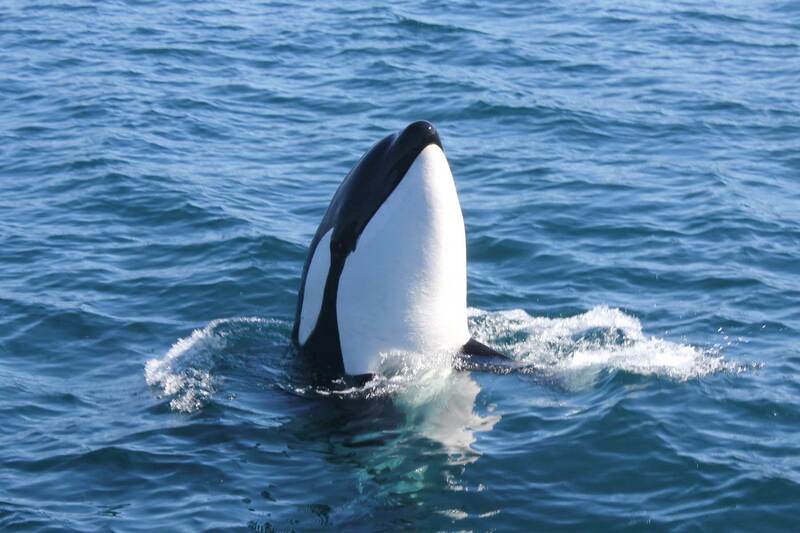 During your 4.5 hour eco-cruise, you are guaranteed to see whales and dolphins – or you get a free trip! Friendly, knowledgeable guides, commentary on the culture and history of the Hauraki Gulf, and a fully licensed bar with snacks available for purchase. Renowned worldwide as a spectacular holiday destination, with warm white-sand beaches, misty rainforests and wilderness aplenty, the Coromandel is the ideal place to relax and unwind. Relax on the coastline, exploring beaches, volcanic reefs and the world-famous Cathedral Cove! Stay 2 nights in Whitianga, Coromandel. 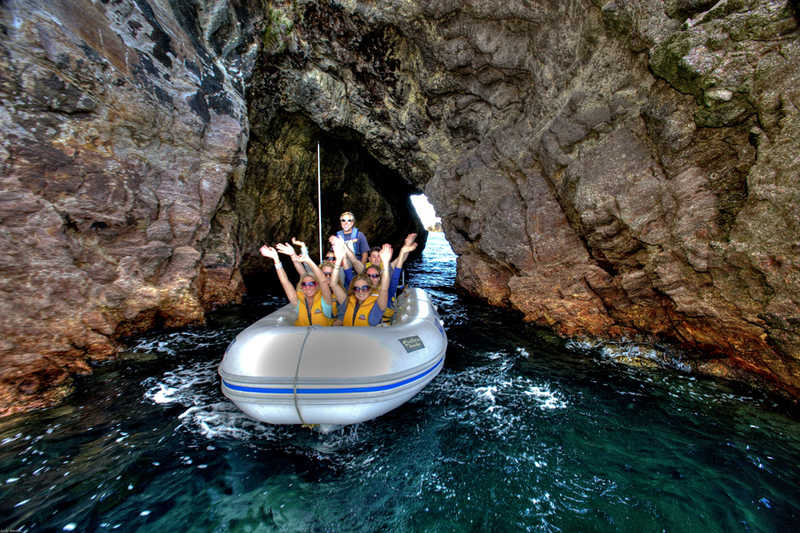 Relax and explore the Coromandel Peninsula for the day, visiting attractions such as Hot Water Beach. 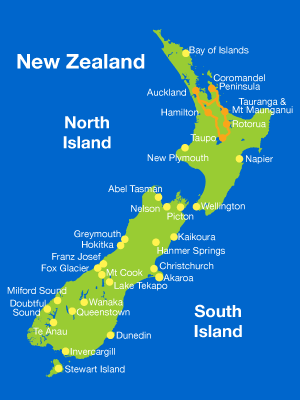 The Bay of Plenty is one of the most popular summer holiday destinations in New Zealand. Located along the idyllic Pacific Coast Highway, it offers a great mix of activities, beaches and dining experiences. Tauranga is the main centre, whilst the coastal suburb of Mt Maunganui is the region’s seaside resort. 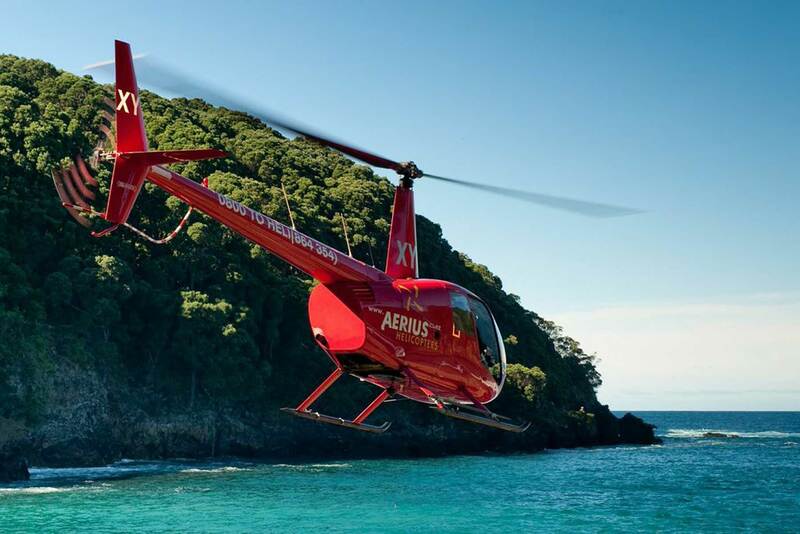 In the afternoon, join Aerius Helicopters for an amazing scenic helicopter flight! Experience a different view of Mount Maunganui and Tauranga city. This flight will take you along the white sandy coastline to the Mount’s Main Beach. Fly around “The Mount” and over Matakana Island on your way to Tauranga city. Sharks and Stingrays are often seen in the shallows during the summer months. This is a great way to see the busy Port of Tauranga, along with the beautiful inner harbour. The Kaimai Ranges, Bowentown heads, and Mayor Island are all visible on a clear day. Stay 1 night in Tauranga. 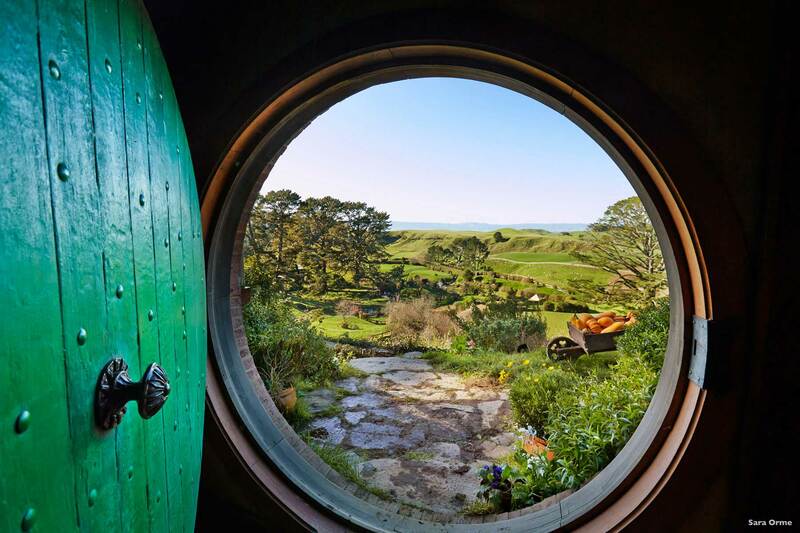 Make your way to Matamata to discover the real Middle-earth on the most picturesque private farmland. Near Matamata, visit the Hobbiton Movie Set from the Lord of the Rings film trilogy in a fascinating two-hour guided tour. The set has been completely rebuilt and will remain as it was seen in the films. There are spectacular views across to the Kaimai Ranges from the rolling green hills of the movie set, which is still a working sheep and beef farm. You can relax and soak up the unique atmosphere with a great cup of coffee or a light meal in The Shires Rest Cafe. Enjoy the scenic journey to Rotorua, distinguished by Maori culture and geothermal activity. This diverse city will put on a display as you encounter geysers, mud pools, steaming craters and 16 beautiful lakes. 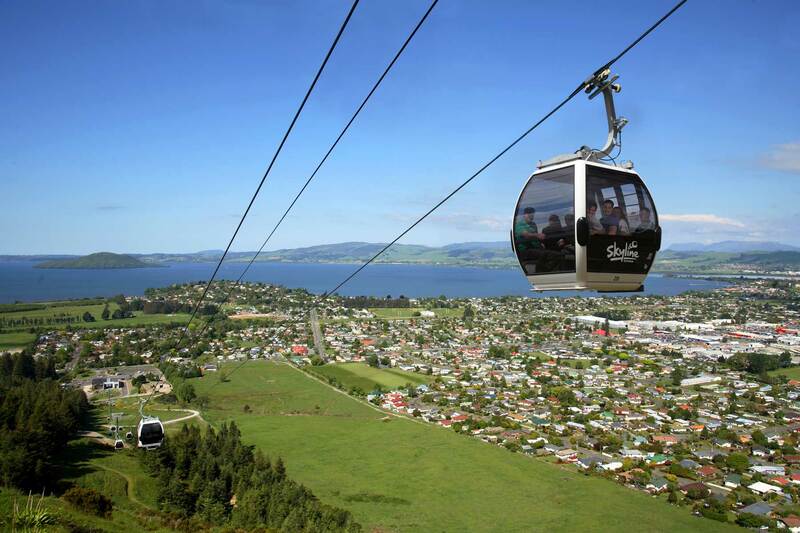 In the evening, enjoy dinner at Rotorua’s most spectacular location – Skyline Restaurant. Sit back and relax as the views from the gondola unfold on your journey to the Skyline complex. The Skyline Restaurant will then serve you a mouthwatering taste of New Zealand, a buffet of legendary proportions. Feast on mouth-watering fresh soups, salads and seafood specialties such as mussels, queen scallops, sushi and sashimi. Enjoy carvery roasts of beef, lamb or pork with specialty sauces to match, with live cooking from your friendly chefs. The legendary Art of the Grill menu will tempt your taste buds even further, with a selection of fillet steak, prawn and Morten Bay Bugs – all cooked on the grill to your liking. Add to that a range of sumptuous desserts, and you’ve got yourself a unique dining experience not to be missed. Tiered seating guarantees stunning views from every table! After dinner, enjoy the scenic ride back down on the gondola. 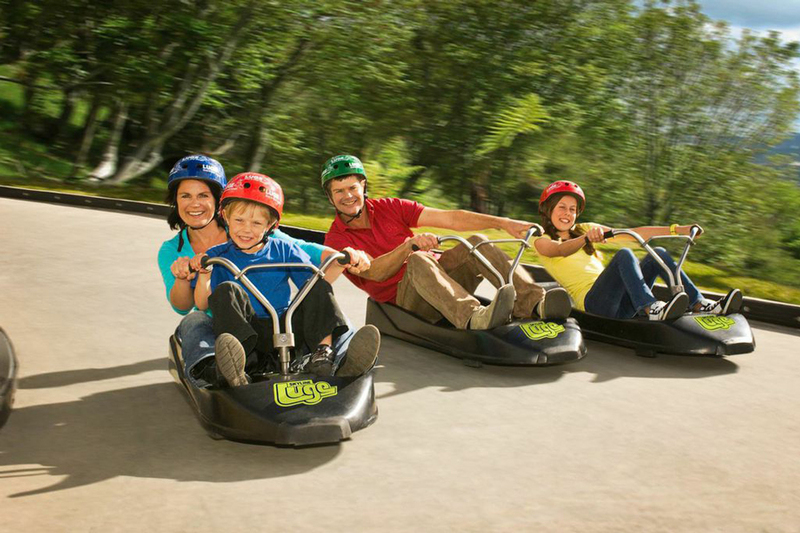 At the top of the gondola you also have the option to add on a thrilling Luge Ride, enjoy nature walks, and visit the Jelly Belly Shop and Volcanic Hills winery and tasting room. Stay 2 nights in Rotorua. Relax in Rotorua for the day. 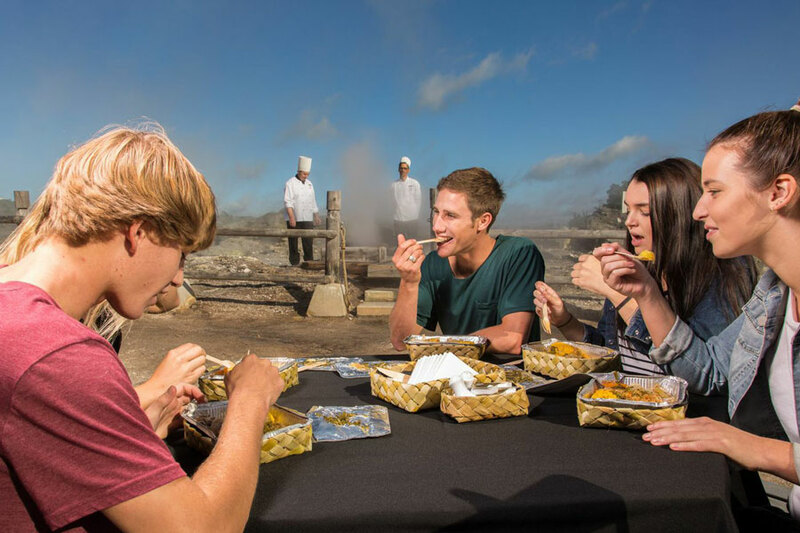 In the evening, enjoy a Maori Cultural Experience including a Hangi Dinner. Hear stories and learn how Maori traditions live on today. Experience an authentic Maori welcome. Watch a challenge by the Maori warriors, a karanga (call) from the Maori women welcoming you onto the marae, and a whaikorero (welcome speech). Relax and enjoy the beautiful waiata (songs), the world renowned haka (challenge), and the elegant poi dance. 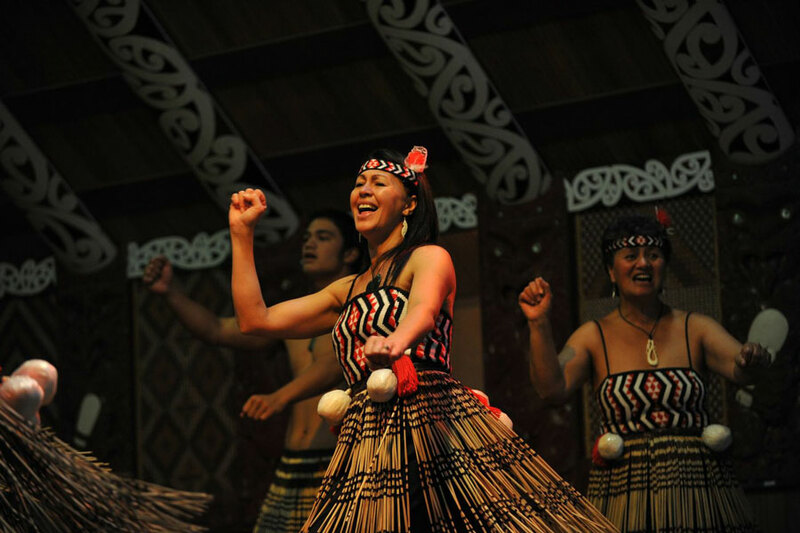 Learn Maori customs including Maori musical instruments, haka and poi. The dining experience is a culinary opportunity like no other. Following dessert, you will be transported down into the valley to conclude your evening beside the awe-inspiring Pohutu geyser. Enjoy the short drive south to Taupo, rich in natural beauty with attractions such as the Huka Falls, relaxing boat cruises, and bungy jumping. Relax in Taupo for the day. Taupo is a great lake for water-skiing, sailing and kayaking. The Maori rock carvings at Mine Bay, which can only be seen from the water, make for a great boat trip or kayaking excursion. The forests surrounding the lake offer hiking and mountain biking to suit all levels of experience. Just north of Lake Taupo you’ll find New Zealand’s most visited attraction, the magnificent Huka Falls, where more than 220,000 litres of water thunder over the cliff face every second. Stay 1 night in Taupo. Venture to the Waitomo Caves, where you will enjoy the Waitomo Glowworm Caves and Ruakuri Caves Combo! Deep underground in the heart of the Waikato are a series of unique caves that will take your breath away. 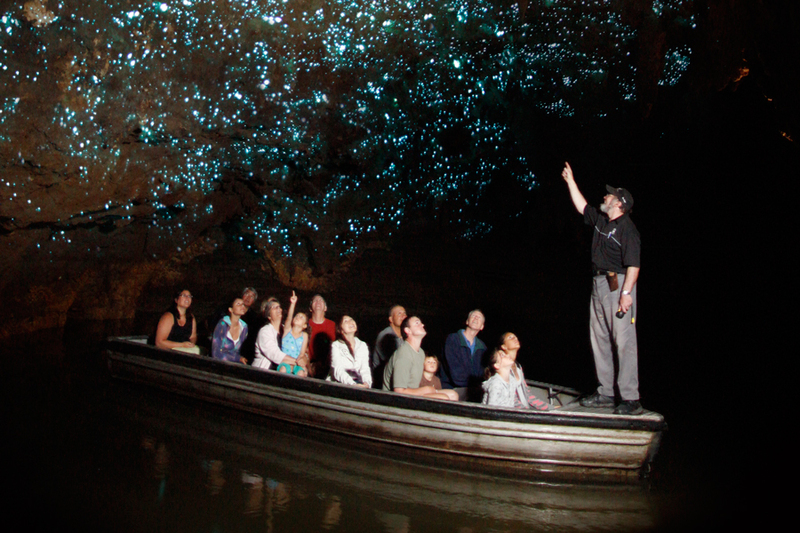 At the Waitomo Glowworm Caves, thousands of tiny glowworms cling to the cave ceiling, creating a starry sky within the underground night. Nearby, the Ruakuri Cave is home to an innovative spiral entrance, echoing waterfalls, and limestone that flows into delicate shawl-like formations. After your Waitomo Caves adventure, journey to Hamilton, New Zealand’s largest inland city, situated on the banks of the Waikato River. As Hamilton is located in the hub of the central North Island, visitors have easy access to iconic attractions such as Raglan’s surf coast and Te Aroha Mineral Pools. For fun, visit the chocolate and candy factory, the Hamilton Gardens, or the weekly markets. From cafes, art galleries, and shopping through to an ever-changing calendar of high profile events, Hamilton is a great holiday destination. Stay 1 night in Hamilton. Drive back to Auckland at your leisure. Relax in Auckland for the afternoon or join the crew and enjoy an America’s Cup Sailing experience, a must-do experience where you get a chance to spend 2 hours out on the harbour on an actual America’s Cup yacht! Stay 1 night in Auckland City. Drop your rental car off at Auckland Airport and depart Auckland.